Often when I write a blog on one issue it leads naturally into another. 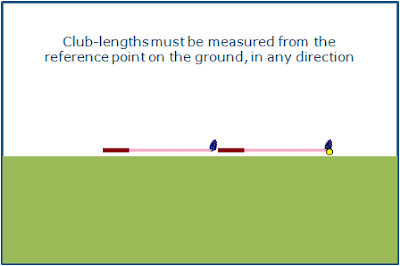 Since last week’s blog I have received several comments and questions on how to correctly measure club-lengths in different circumstances. 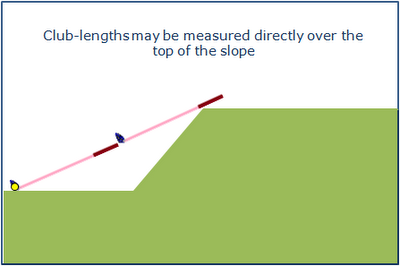 Here are some graphics that I think will help you understand the concepts (with acknowledgements to regolegolf.com). 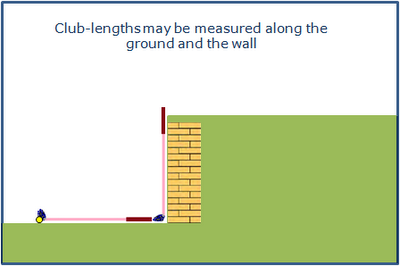 From this last example you will see that when the ball lies on ground it is not permitted to measure horizontally across different levels. 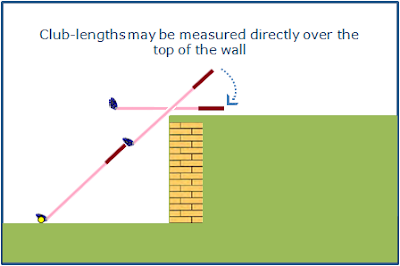 If the ball is on the top level you may either measure to the edge of the wall, down the wall and along the ground at the lower level, or to the wall and directly over it as in the 5th illustration. However, if a ball lies off the ground (e.g. 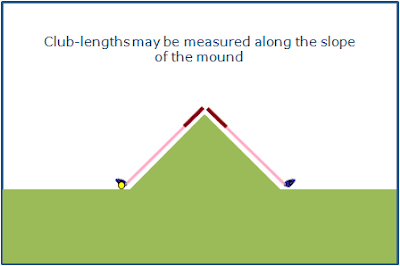 in a tree) then you may measure the club-lengths from the point on the ground immediately below the place where the ball lay in the tree. Please forward the link to this blog (www.barryrhodes.com) to anyone that you think may also be interested. You can receive notice of my new blog entries by email by entering your email address in the box at the top right of this web page. score of players using such putters!! congratulations for all your are doing. 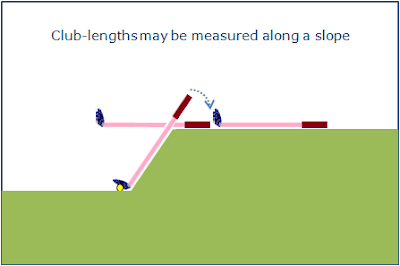 Is it illegal to use a Bushnell Lazer V2 in competition golf. I have not seen anybody using one or something like it on the tour. Is it banned on the PGA TOUR. The company's say it is legal to use but haven't seen one yet on tour. Thanks JB. 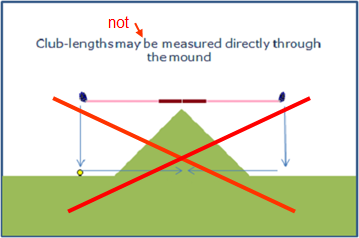 "Note: The Committee may make a Local Rule allowing players to use devices that measure or gauge distance only." 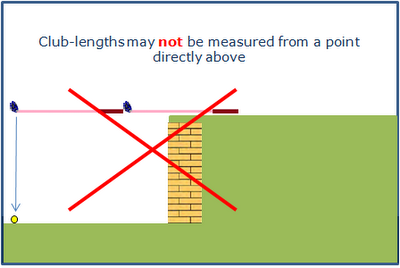 So, you have to check the Local Rules carefully before you take a distance measuring device onto the course. Many resort 'pay-as-you-play' courses do permit them, but many private member Clubs do not.